From Roland Emmerich, director of Independence Day, The Day After Tomorrow and 2012, comes the hard-hitting, non-stop thrill ride White House Down available on Blu-ray Combo Pack, DVD and Digital on Nov. 5 from Sony Pictures Home Entertainment. 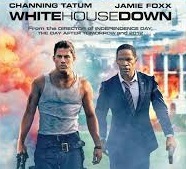 Two of Hollywood’s most sought-after actors, Channing Tatum (21 Jump Street, Magic Mike) and Academy Award winner Jamie Foxx (Best Actor, Ray, 2005), team up in this explosive action thriller about a capitol policeman (Tatum) trying to protect the U.S. President (Foxx) during a hostile takeover of the White House. Featuring breathtaking action sequences and special effects, White House Down also stars a top-notch supporting cast, including Maggie Gyllenhaal (The Dark Knight), Jason Clarke (Zero Dark Thirty), Richard Jenkins (Jack Reacher), Joey King (The Conjuring) and James Woods (Casino). Capitol Policeman John Cale (Tatum) has just been denied his dream job with the Secret Service of protecting President James Sawyer (Foxx). Not wanting to let down his little girl with the news, he takes her on a tour of the White House, when the complex is overtaken by a heavily armed paramilitary group. Now, with the nation's government falling into chaos and time running out, it's up to Cale to save the president, his daughter, and the country. Culver City, CA (9/3/13) – From Roland Emmerich, director of Independence Day, The Day After Tomorrow and 2012, comes the hard-hitting, non-stop thrill ride WHITE HOUSE DOWN, available on Blu-ray™ Combo Pack, DVD and Digital on Nov. 5 from Sony Pictures Home Entertainment. 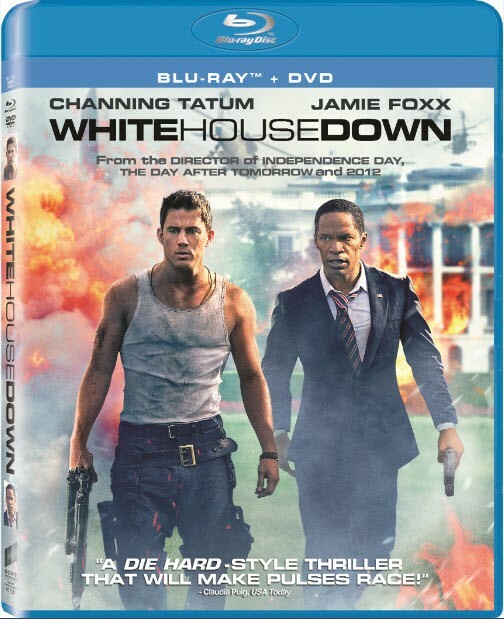 Two of Hollywood’s most sought-after actors, Channing Tatum (21 Jump Street, Magic Mike) and Academy Award® winner Jamie Foxx (Best Actor, Ray, 2005), team up in this explosive action thriller about a capitol policeman (Tatum) trying to protect the U.S. President (Foxx) during a hostile takeover of the White House. Featuring breathtaking action sequences and special effects, WHITE HOUSE DOWN also stars a top-notch supporting cast, including Maggie Gyllenhaal (The Dark Knight), Jason Clarke (Zero Dark Thirty), Richard Jenkins (Jack Reacher), Joey King (The Conjuring) and James Woods (Casino). The Blu-ray disc comes with over an hour of bonus features, including an exclusive gag reel, along with nine exclusive making-of featurettes, taking audiences behind the scenes to see what it took to bring the high-adrenaline adventure to the big screen (more details below). Both the Blu-ray and DVD come with four additional behind-the-scenes featurettes (more details below), chronicling the on- and off-screen chemistry between the dynamic leading duo, their willingness and desire to train for and perform their own stunts, a look at Emmerich’s vision for the film and how he was able to achieve it, along with a spotlight on the star-studded supporting cast. WHITE HOUSE DOWN was written by James Vanderbilt (The Amazing Spider-Man, Zodiac). It was produced by Bradley Fischer (Black Swan, Shutter Island), Harald Kloser (2012, The Day After Tomorrow), James Vanderbilt, Larry Franco (2012, Batman Begins), and Laeta Kalogridis (Avatar, Shutter Island), with co-producers Volker Engel (2012, Anonymous) and Marc Weigert (2012, Anonymous). Executive producers are Ute Emmerich (2012, The Day After Tomorrow), Channing Tatum, and Reid Carolin (10 Years, Magic Mike). It has a run time of approximately 131 minutes and has been rated PG-13 for prolonged sequences of action and violence including intense gunfire and explosions, some language and a brief sexual image. o The Beast – A look at the film’s presidential limo, better known as The Beast. o VFX Boundaries Down – From massive blue screens to virtual sets, audiences will discover technologies that were literally invented by filmmakers. o The Inside Story – Uncover this concept’s fast-moving rise to the big screen. o Presidential Treatment – A look at the size and scope of this massive production. o Lights, Camera, Heart-Pumping Action – Uncover how filmmakers utilized a unique and stylistic approach to lighting, as well as various filming techniques to capture the true scope of the film’s immense action. o Crashing The Oval Office – See how filmmakers constructed a stunt set then drove an SUV at full speed into the Oval Office. o Drowning The Beast – The presidential limo escape. o Recreating The White House – Hear from the filmmakers about the meticulous detail that went into replicating the White House. o A Dynamic Duo – a look at the chemistry between Tatum and Foxx and their dynamic on-screen presence. o Men Of Action -- Discover Tatum’s willingness and desire to perform his own stunts, as well as the extensive training required. o Roland Emmerich - Upping The Ante – A look at Emmerich’s vision for the film. o Meet The Insiders – Shining a spotlight on the star-studded supporting cast.